The Gary Player designed Raven Golf Club at Snowshoe Mountain Resort provides an impeccable course with gorgeous scenery every step of the way. Long fairways take advantage of the rolling terrain, some dropping as much as 200 feet from tee to landing area. Tees are framed by beautiful vistas, and each hole is unique to itself, offering a golf experience unmatched anywhere else. We invite you to see for yourself why GolfWeek magazine has ranked The Raven Golf Club the #2 public course in the state of West Virginia and the #30 public course in the U.S.
Package a round or two at the Raven with a night at Rimfire Lodge for this season's best deals. 1 night plus 1 round starts at just $99 during value season and just $109 during peak season. Call 304-572-6500 or 877-441-4386 to book tee times. If you like the idea of putting a twist on the traditional rules of the game, our Stableford League may be right for you. For those who aren't familiar, Stableford games use a modified scoring system where points are awarded in relation to a fixed score on each hole. The simple explanation is the highest score, instead of the fewest strokes, wins the game. It makes for a more competitive atmosphere with faster play and in the end, a few bad holes won't throw off your entire game. It's just $20 to join the league, plus $10 per game (one a week). Call the pro shop for more details! We call it the "Local's League" because it's popular among employees and others from the area (probably because it's just $8 to play, plus cart fee), but anyone is welcome to join this traditional scramble. We play this one with teams of four, but if you're flyin' solo, don't worry. Teams are divided up at the Club House, then we're off to play best ball (wherein all four team-members hit, and wherever the best ball lands is where all four players begin their next turn). Make sense' Just call the pro shop if it doesn't. Contact Raven Golf Club at Snowshoe Resort at 304-572-1000 for more information and details on holding a golf outing at the course. Snowshoe Mountain offers base of the mountain hotel accommodations. On top of the mountain there are condos. The Raven Grille offers a complete breakfast and lunch menu as well as stunning views of our course and surrounding area from the top floor of the picturesque clubhouse. The clubhouse features plenty of indoor and outdoor seating, a balcony on three sides and beautiful windows with a vaulted ceiling. 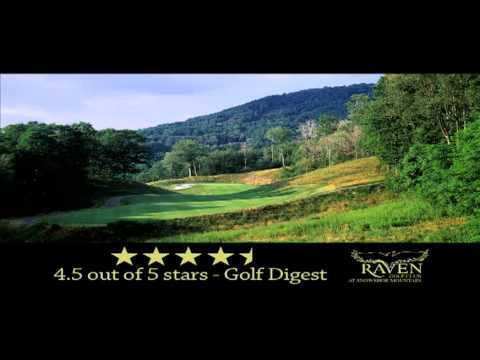 Watch the Raven Golf Club At Snowshoe Resort Video. This profile was last updated on 06/04/2018 and has been viewed 10,094 times.